Today | Honeywood (Dr. A. J. Porter) Heritage Nursery Inc.
Honeywood is home to fields of lilies, fruit trees, peonies, daylilies, roses and a collection of specialty trees & shrubs to be found throughout the nursery. There is a unique gift shop located in the log home and a picnic area with tables outside on the lawn. Stroll through the gardens located in the main yard or take a longer walk to get a close up view of the fields, orchards and the many outstanding trees collected by Dr. Porter. 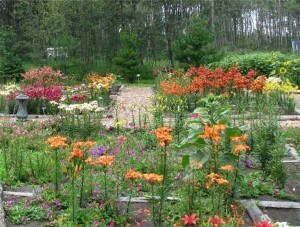 The nursery is open to visitors throughout the season. The effort to preserve the nursery has been recognized in Saskatchewan not only by its heritage designation but also by Tourism Saskatchewan and the Architectural Heritage Society of Saskatchewan. We are also recognized beyond the boundaries of Saskatchewan when we received the 2005 Prairie Garden Award for Excellence based in Winnipeg. Today, the Dr. A. J. Porter Memorial Garden contains 36 Porter Lilies & 14 Honeywood Introductions of the 64 varieties of lilies considered Honeywood Lilies. 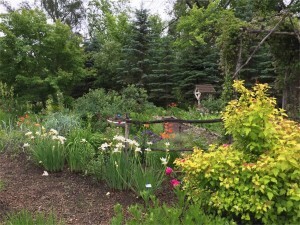 Some of the Porter fruit included in this garden: Spring Snow flowering crab, HoneyRed Rhubarb, Parkside Gooseberry, Honeywood Sandcherry & Honeywood Saskatoon are all thriving and give visitors an insight into the many interests of Dr. Porter. The Allan Daku perennial display garden was originally designed & planted by the local Walter Willoughby Horticultural Society in 2006. It was named the Allan Daku garden to recognize the contributions made to Honeywood & the society by the one-time manager/partner. An annual display garden is planted in front of the log house to acknowledge the love of annuals Mrs. Winnie Porter was known to have. The Melba Jenkins species lily garden is named after the late wife of friend & benefactor Malcolm Jenkins to appreciate both his contributions to the nursery & his late wife’s love of lilies. Bert Porter received world fame for himself and Honeywood Lilies and Nurseries through the introduction of his many hardy beautiful lilies. He received recognition at home and throughout the Prairie Provinces for his efforts to provide hardy fruits that would survive our harsh prairie climate. His home and nursery are an important reminder to our generation and future generations that the fruit we enjoy in our yards and gardens did not just happen but are the result of years of testing and research by people like Dr. Porter. Honeywood (Dr. A. J. Porter) Heritage Nursery, as his home and nursery, is the foundation of the work carried out by him throughout his life. It is imperative that we as guardians of the past retain this piece of history for our children and grand children to enjoy.